Now admittedly a hair dryer isn't the most exciting of beauty gadgets, but Babyliss boutique hair dryer gets the job done quickly and from an aesthetic point of view, the sleek black design looks a lot nicer than some of the other hair dryers I've used in the past. It's got a range of user friendly features too. There are 2 speed and 3 heat settings, so you can really control the intensity at which you want it to operate. The 2.7m cord comes in rather handy too, especially as I like to sit down in front of the mirror when blow drying my hair. In the mornings, I usually just blast the hair dryer all over, but if you want a more targeted blow dry, then it comes with an attachable slim nozzle as well as a drawstring fabric pouch for travelling. 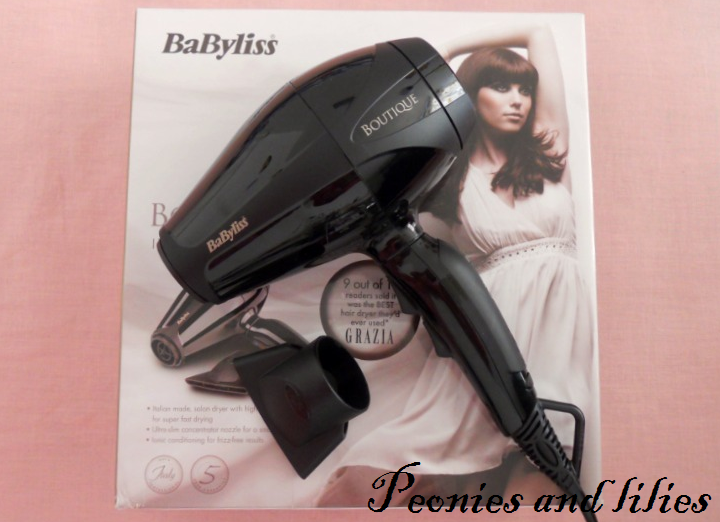 Compared to my previous models, Babyliss Boutique hairdryer is on the heavier side, but the advantage is that it's ceramic coated and has ionic technology, so helps to smooth my hair and protect it from excessive heat damage. Since using this, it's really helped to reduce my drying time. I would prefer it if it was a little lighter, but the advanced technology and heat settings more than makes up for this. Definitely one to consider if you're on the look out for a new hair dryer. Have you tried any of the Babyliss boutique range? What are your must have hair gadgets?